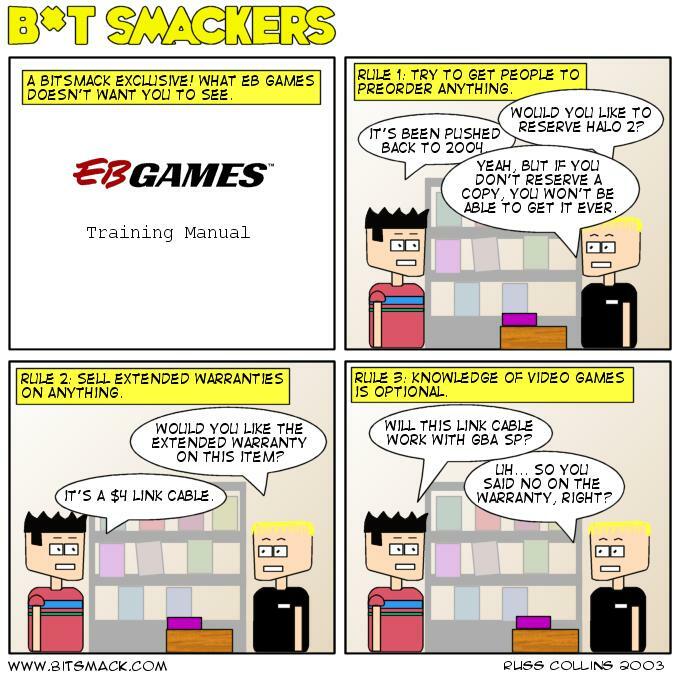 A discussion with TheRogg and Goz prompted <a href=http://www.bitsmack.com/modules.php?op=modload&name=Comics&file=index&action=comic&id=264>this comic.</a> I know I bash EB Games and it really isn’t that bad. I’m sure some of their stores have knowledgable employees. I was hoping to do a Wind Waker comic today but my copy won’t arrive in the mail until tomorrow. In other news I fried my motherboard while trying to assemble a second machine from spare parts. I couldn’t get it to power on at all. When I heard a snap and smoke started coming out, I knew something bad had happened. Needless to say, I’ve abandoned the idea of trying to build my own computer anymore, especially when you can get a complete system from Dell for like $499. I plan on getting one of these by summer to use for trying out Linux and LAN gaming. Maybe K-Dog will be able to get me interested in PC gaming again. He was doing a pretty good job the other night when we were playing Jedi Knight II online. Also I saw a commercial last night for some movie called “Holes”. Did you know that the hole’s biggest natural enemy is the pile?